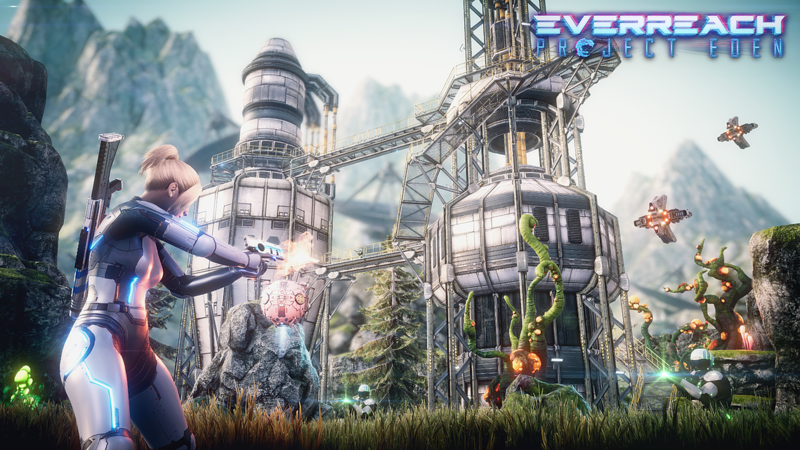 I recently sat down with Dieter Schoeller, CEO and Founder of Headup Games, as he gave me a first hand look at Everreach: Project Eden, a new title from developer Elder Games that has a tentative release date of fall 2019. Planet Eden is the new home mankind desperately needs. Lush, beautiful, and uninhabited, it could be the perfect escape from a polluted, overcrowded Earth. But something’s happened to the first settlement, and a task force from Earth has come to find out what. 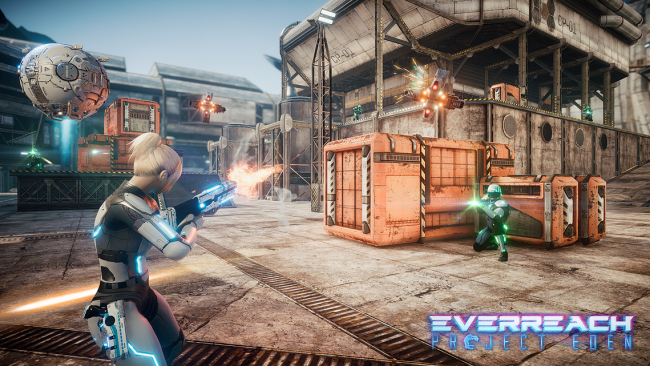 As Lieutenant Nora Harwood, it’s up to you to secure the colonization project, confront the real enemy, and uncover the ancient mystery of Eden itself. The game opens as you and your team are entering the atmosphere of Planet Eden. Unbeknownst to you and your team, a highly advanced civilization has thrived on the planet and see you as an illegal invader. Your ship is subsequently shot out of the sky and you’ll have to navigate down to the surface relying on your jetpack. Once on the ground of this beautifully created planet, you’ll have to search to find the rest of your team, avoiding or fighting its current inhabitants in order to survive. The game boasts at least eight hours of story related gameplay, with a story written by Michelle Clough, game writer and former narrative QA for the Mass Effect trilogy. It is a story-driven, open world, action RPG with moral choices that will affect the overall story of the game. I was shown the upgrade screen so that I can see the depth of the RPG system, with upgrades that can be selected based on how you want to play the game. For example you can be more stealthy versus more combative. 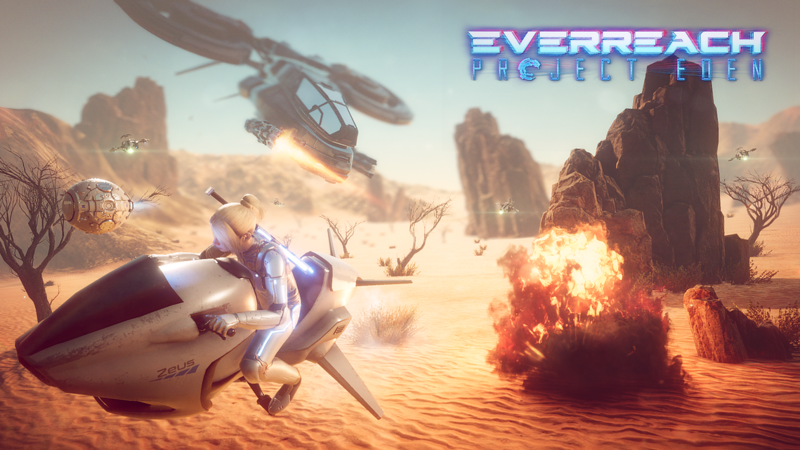 You can also upgrade your gear with more than 80 upgrades and that includes your hoverbike, which looks like a fun way get around and fight. I was shown around 10 minutes of gameplay and the game looked incredibly polished. It was running very smoothly on a laptop, with an HDMI connection to a 4K TV, so we didn’t get to see the PS4 version directly. I witnessed a very detailed environment, with lifelike water features and foliage, and a breath taking waterfall. The game world was designed by artists who worked on movies such as WarCraft and Star Trek: Beyond, and takes on sci-fi look and feel. The soundtrack was worked on by folks who worked on Lifeless Planet and Evochron Legacy, so that should fit in well. It really was a gorgeous game with fluid animations from not only the characters but also the environment. While I didn’t get to see any hoverbike battle gameplay, I did get to see a trailer that included some and it looked like a lot of fun. I did witness some firsthand gunplay that was pretty impressive, with a cover system that utilized a dynamic force field you can deploy. The force field can double as a weapon, so using it correctly will probably take practice. Everreach: Project Eden is gorgeous game, set in an alien world, but from what I saw, I’m not sure if we are the good guys or the bad guys. Only time and the storyline will tell, and I can’t wait to find out.